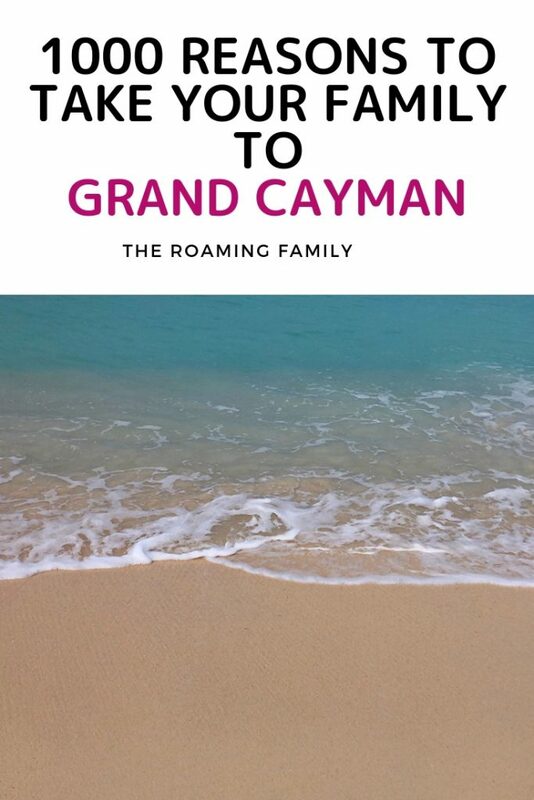 Having experienced Grand Cayman years ago, I had no idea whether Grand Cayman with kids was a possibility. After my trip there last month, I’m happy to report that yes, Grand Cayman is family friendly! Grand Cayman is the larger of the 3 islands that make up Cayman. Don’t call it “the Caymans”. It irritates Caymanians. Call it Cayman, emphasis on on the “man”. This was just one of the many things I learned during my trip there. Who knew that Grand Cayman was not only stunningly gorgeous, but also filled with history, brimming with culture and has residents from all over the world!? Everywhere we went, we met people from Eastern Europe, Western Europe, Australia, the U.S., New Zealand and countless South American countries. All are there to experience a stress free life, shining sunshine, a relatively easy resident’s permit and no income tax. Cayman has a variety of places to stay, from super duper 5 star to family friendly 3 and 4 star resorts. A popular way to visit this Caribbean gem is a condo. While I prefer a resort to make things easier on me, I can understand a family’s need for a condo and Cayman has plenty that fit the bill. Ritz Carlton Grand Cayman: This resort is just as spectacular as other Ritz Carlton properties. Spacious, immaculate rooms, sprawling pools and kid’s club, amazing restaurants and beyond description beach. The Ritz is right on Seven Mile beach – which is the place most people want to stay. If you’re looking for family friendly Cayman, Ritz is a perfect place. Thinking about a little relaxation time by the pool with your spouse? Check. Drop your kids at the fun kid’s club. Wanting a little paddle board time? Check. You can do so right in front of the hotel. Hoping for a movie night outside? Check. Every Saturday by the family pool. Marriott Grand Cayman: Walking into Marriott Grand Cayman immediately relaxes you. A super beachy vibe in the lobby which I loved. The spa is right off the lobby and smelled incredible. A very open restaurant and bar immediately greet you. 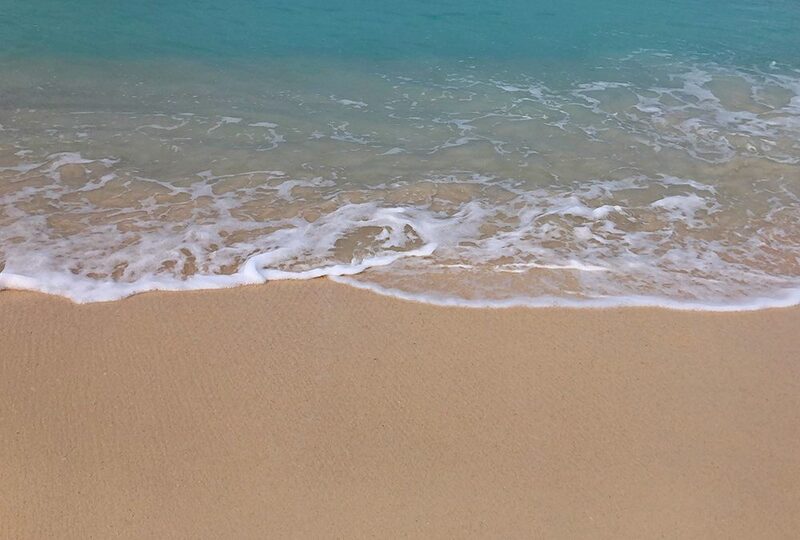 I loved the beach feeling. The resort has a lovely courtyard (there were even turtles in the pond!) 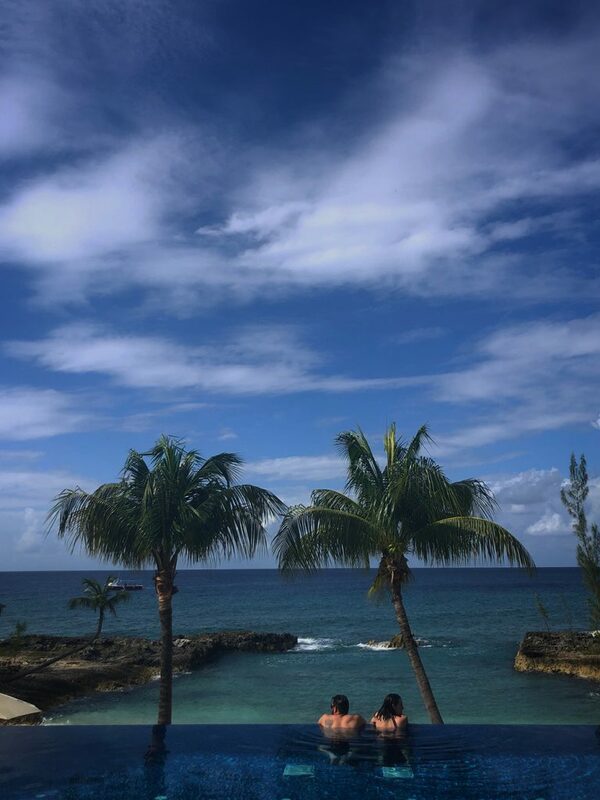 to relax in and the ocean view rooms have beautiful views of Seven Mile beach. The kid’s club has an amazing view of the beach too! Like the lobby, the pool area has that California beach vibe and it’s right on the sand. When we were there, the beach was extremely narrow, however. And I learned that a few weeks later, the beach completely disappeared. The resort said it was weather related and usually it’s much larger, but it’s worth asking about if you’re thinking of staying there. Westin Grand Cayman: I loved this place. Love love love. The lobby was insane. Huge and modern, yet had a beachy feel at the same time. Gigantic windows looking out onto the pool and beach. Doors open up to the pool, which revealed my favorite pool feature – the swim up pool bar. Everything was slick and clean and beautiful and the beach is huge. I loved the cabanas on the beach (some were two stories)! I would describe the hotel as “approachable luxury”. It doesn’t have an overly stuffy feel and it’s perfect for families. Kimpton Grand Cayman: What. an. amazing. resort. Right on Seven Miles Beach with something for everyone. Couples on their honeymoon, friends, or families with kids will all love this resort. The family rooms have a separate bedroom and amazing bunkbeds above the couch in the living room. There’s not a kid in the world that wouldn’t love this room. And the pool? Beyond. And the kid’s club incorporates cultural activities into every day. Caribbean Club: This is a condo complex that is really convenient for larger families. 1-,2- and 3-bedroom villas/condos make up the property and they are surprisingly reasonable. This isn’t a luxury resort, but it has spacious condos, a pool, and a restaurant. In addition, they have resort like amenities, such as daily maid service, room service and massage services. This is a great option for families looking to save a bit and still have plenty of space. A warning though – if you think you’ll save a ton by shopping and cooking for yourself, you won’t save too much. Food and alcohol prices are crazy expensive. Villas of the Galleon: Galleon is another villa/condo complex. A great option for families who want spacious 1-, 2- or 3 bedrooms places. It’s bare bones and just the condo (no resort services), but beautiful. The grounds are stunning, but there’s no pool if that’s important to you. But with the perfect Seven Mile Beach right next to the resort, who needs a pool? Luxury Cayman Villas: A house is a great option for larger groups and Luxury Cayman Villas has plenty on their inventory. Anything from a two bedroom unit within Kimpton Seafire Resort to a huge 6 bedroom house with a chef’s kitchen is possible. And the villas are located all over the island, so if seclusion is more your thing, consider a villa near Rum Point of over in South Sound. Where to even start with this one. The beach activities? The cultural facts? The food? Let’s start with the beach! Water sports abound and when looking for things to do in Grand Cayman, look no further than the beach. Paddle boarding, sailing, snorkeling, parasailing, boating trips, fishing and mangrove tours are just the beginning. Cayman has some of the best diving in the world. Not only are there coral reefs and incredible wall dives, there are shipwrecks and submarine wrecks. I’m not a diver, but people rave about the area. Cayman is famous for their Stingray City. Caymanians think that Stingrays began gathering on this sandbar decades ago when fisherman returned from outings and stopped in the area to clean their fish. Today, they gather about looking for food and they are extremely friendly. 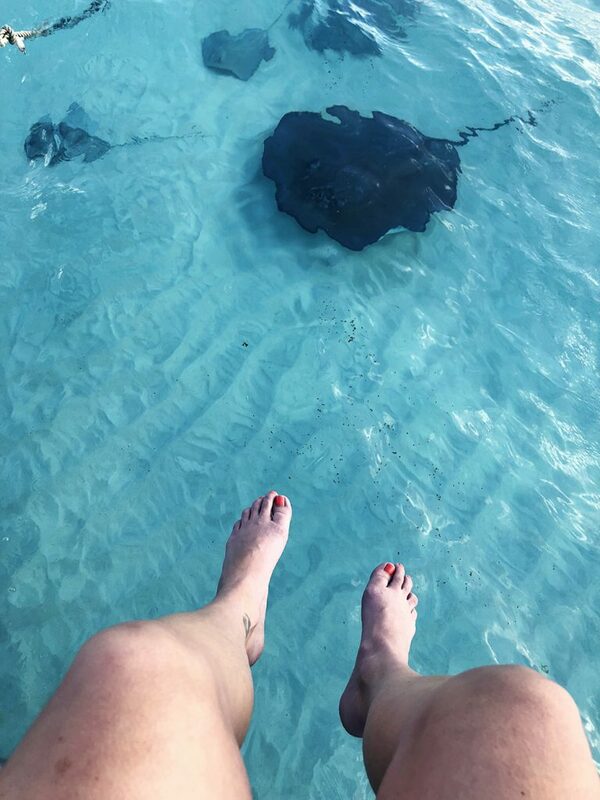 Experienced guides help you learn how to “hold” the stingrays and legend says if you give them a kiss, it’s 7 years of good luck! Try to get on the first boat out in the morning….before the cruise ships descend. Bioluminescence Bay was one of my favorite activities and reminded me of the time we saw bioluminescence in Colombia. 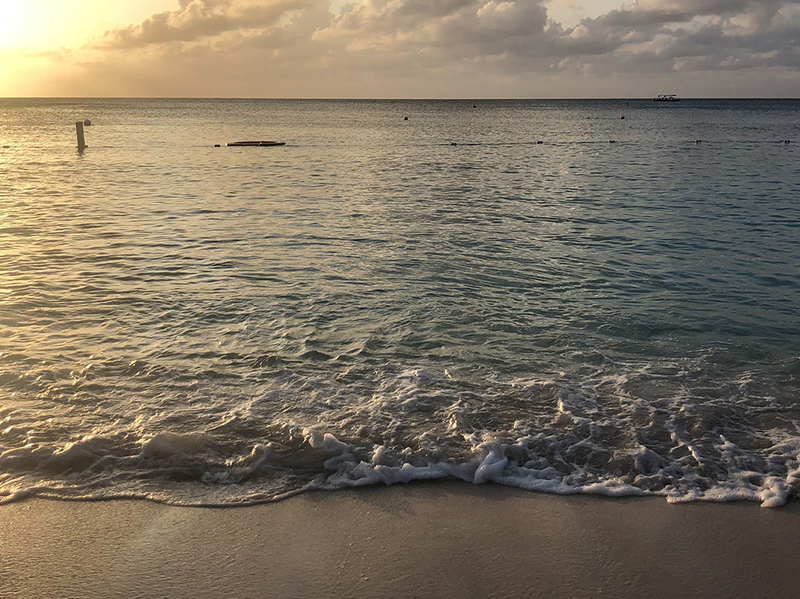 The area to see it in Cayman isn’t too far from shore and in a bay surrounded by luxury homes so it’s not super remote, but it’s just as magical. Jumping into the water causes a reaction with the plankton and your body will “glow” and leave trails of sparkles. In the bay, there are jellyfish but at nighttime they are asleep on the floor of the bay. Just make sure you keep your feet up in the 4 foot deep water…if you step on one, they’ll sting you! Pedro St. James: Cayman has an astounding amount of history that I knew nothing about prior to visiting. Much of this history can be learned with a visit to Pedro St. James. The building was built in the late 18th century by a wealthy Englishmen’s use of slave labor – William Eden. It housed numerous things during the years, including a jail, a restaurant and a courthouse. it was also the site where slavery was abolished in Cayman in 1831. The tour is given by a charming man who is descended from William Eden and takes you through the entire history of Cayman, which was first spotted by Christopher Columbus in 1503. The house has been rebuilt after fires, hurricanes and various other calamities but it’s a great place to learn about something besides the beach! 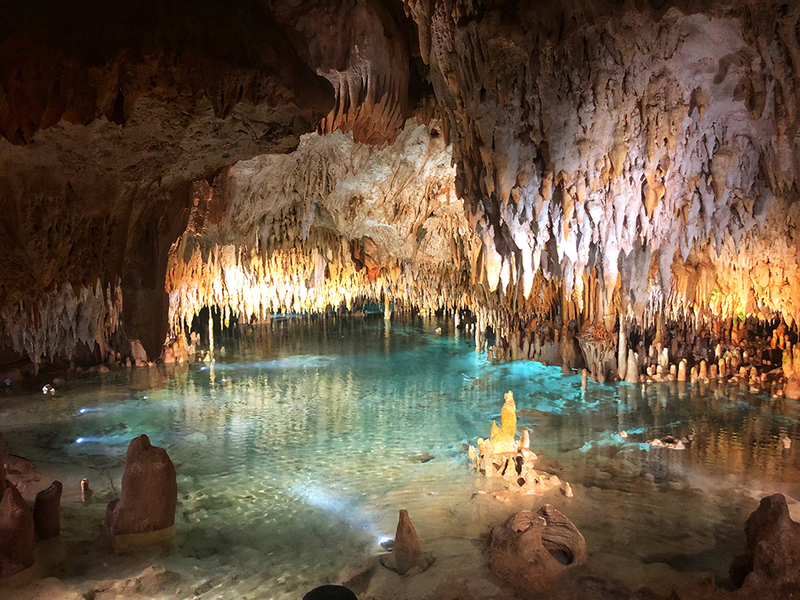 For families looking for a break from the beach, the Crystal Caves are an interesting option and I had no idea they existed before our visit. The caves formed millions of years ago and house stalactites and stalagmites that contain deposits that formed crystals. Pirates used the caves as hideouts hundreds of years ago so, of course, there are always rumors of hidden treasure. The caves are fairly spacious, which was a relief to this claustrophobic girl. And strategically planted lights illuminate the crystals, making a dazzling sight. Combine that with a hike through forest and you have the makings of a perfect 1/2 day outing with your kids! Fun fact: to tell the difference between stalactites and stalagmites…stalactites hang “tight” to the ceiling and stalagmites “might” reach the ceiling. 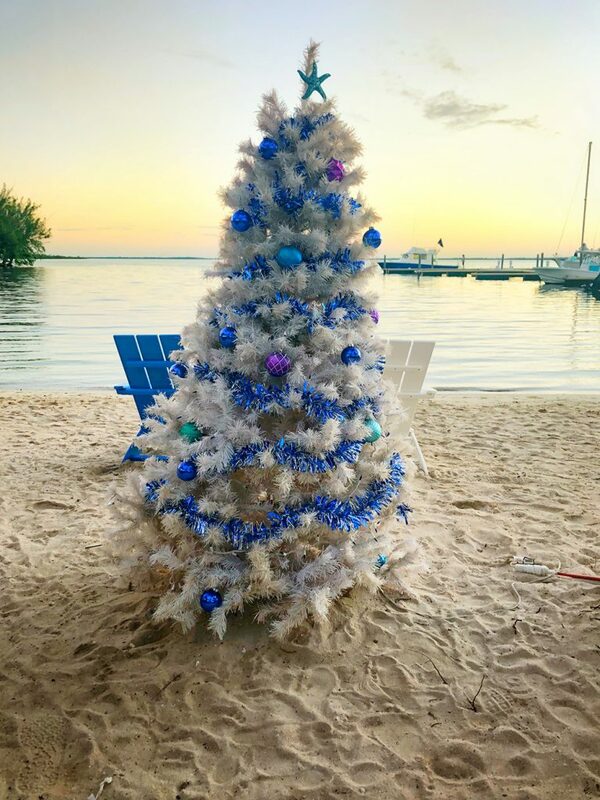 Kaibo Beach Bar and Grill: If there’s a more family friendly spot and pleasant, casual atmosphere, I sure would like to see it because this place was perfect. Tables right on the sand, casual food and right by the water. And a cute bar. The whole place is open air and has major island vibes. The conch fritters are a must. Eat’s Cafe: This has to be one of the most popular places near Seven Mile Beach. And it’s been around foreeevvvver. It’s right across the street from the Westin and serves casual fare. Everything from breakfast to pizza, to Mexican to burgers. It’s impossible not to find something to eat for your picky kids at Eat’s! Camana Bay: Camana Bay is actually a “town center” in Cayman that houses boutiques, restaurants, coffee shops and more. It includes some of the best restaurants on the island. Agua, in particular, is spectacular. While it may not be considered a “family restaurant”, the menu is varied and the waterfront tables make for some great people watching. Too fancy for the kids? Try The Brooklyn Pizza and Pasta or The Waterfront Urban cafe. We can’t wait to go back to this warm, inviting island. It’s rare that you find an island in the Caribbean with such a varied mix of ethnicities and backgrounds. It had a Caribbean vibe – think steel drums – yet also had a very familiar feel to it at the same time. It’s the perfect trip for a family who hasn’t spent a lot of time outside the U.S. yet. And with so much to do, it’s sure to encourage families to visit other Caribbean islands! 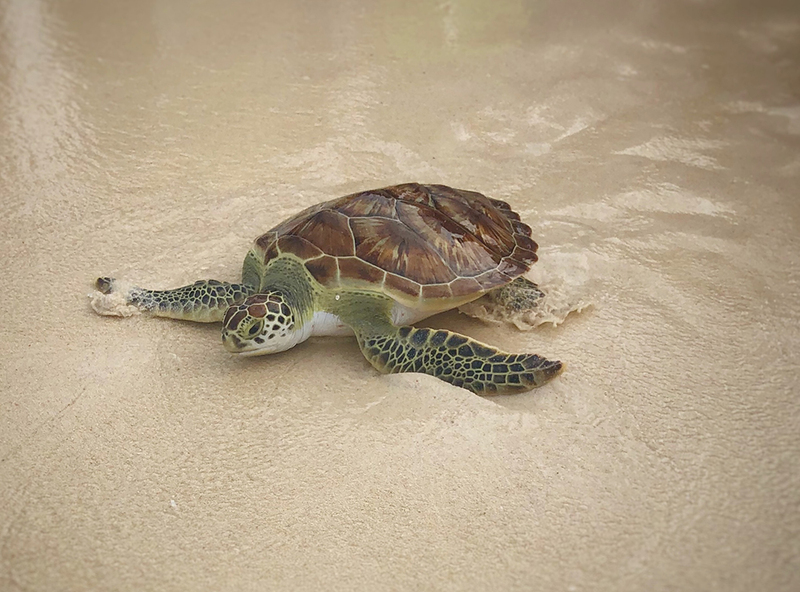 Thinking of visiting Cayman? I can help you plan and have the inside scoop on everything from resorts to condos to activities and food! You can contact me at mdownham@departurelounge.com.